In this week’s episode of Soundwaves, the official podcast of SLUG Magazine, SLUG‘s Senior Staff Writer, Mariah Mellus, explores two free summer events you should be checking out: Granary Row and the Sugar House Art Walk. The Sugar House Art Walk is an art stroll that takes place every second Friday of the month. Much like other Stroll events, galleries in the Sugar House area, we well as select businesses with art on the walls, open up their doors for the public to come through and check out new local artwork. Locations include Unhinged, Local Colors, Smith Crown, The Green Loft, Joffee’s Coffees, Rockwood Studios, Artistic Framing Co., Sugar House Coffee, Saltgrass Printmakers, Brittany Golden Studio, the Cameron Wellness Center and One World Gifts & Gallery SLUG Senior Staff Writer, Mariah Mellus, sat down with one of the current organizers, Laurie Bray, to talk about the walk. Granary Row is a summertime pop-up street festival held every Friday and Saturday evening for three months. The impromptu venue takes up 700 South between 3rd & 4th West in downtown SLC, made up primarily of shipping containers and a biergarten. 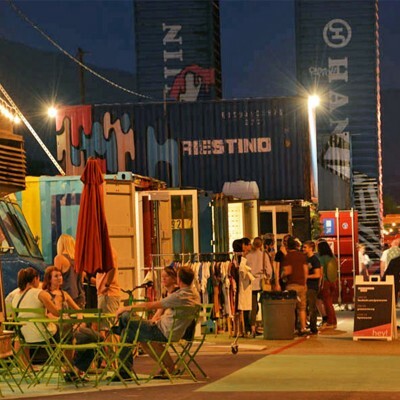 Select small vendors move into the small shops created in the containers to hold business during the evening hours, as well as food vendors and performers to provide the evening with additional flair. Mariah Mellus sits down with Christian Harrison, one of the co-founders of the Row, to talk about this year’s evenrts. Music for this episode was provided by two local artists, Skellum and Clay. Both artists produce electronic music and their music can be found here and here, respectively.